I don’t often talk about news on this blog but a post appeared on twitter today that I just had to talk about. Untitled Disney Fairy Tale (live action)- We have all been wondering what the heck this was supposedly premiering in July. Well now it is next August but surprising they won’t just announce the title? Ralph Breaks the Internet: Wreck it Ralph 2- Disappointed to hear this awful title is final but moving it from March to November is caused by the changes to Gigantic. This is fine for me. Wrinkle in Time and Magic Camp- Wrinkle in Time is taking Wreck it Ralph 2’s spot. I love the book so I am soooooo hoping it will be good. Magic Camp is now officially announced and I’m very curious about it. I hope it will be fun! Star Wars: Episode IX- They are moving it from December to May and while I do like getting our Star Wars episodes sooner I kind of liked having a Star Wars surprise at Christmas. I wonder if we will get an animated Star Wars or something like that at Christmas? That’d be cool. Indiana Jones- So this has moved to 2020. I bet this has more to do with Steven Spielberg than anything else with projects like Ready Player One working on right now. But seriously how old is Indy going to be in this movie! Lion King (live action)- We have a date for this “live action” Lion King remake. The only weird thing is that another live action Disney movie is coming out the next month which seems very close together. Frozen 2- I think most of us knew Frozen 2 was coming in 2019 but this is the official announcement and date. I know what I will be seeing Thanksgiving 2019! 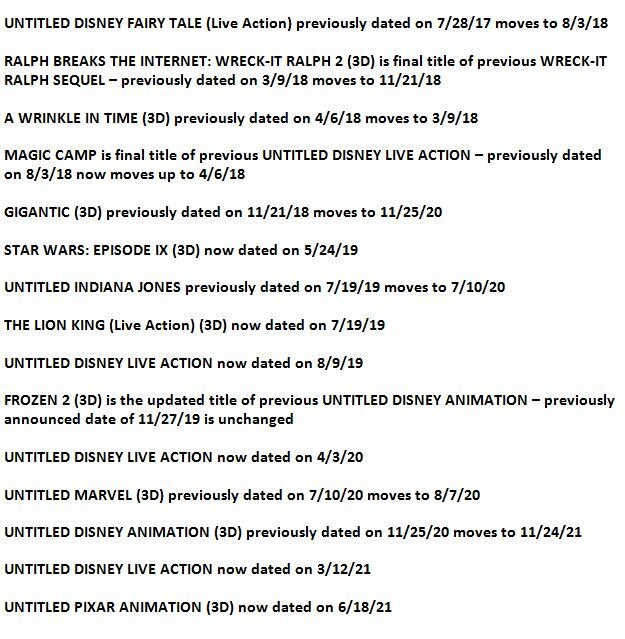 The rest are all untitled projects so not much to say about them except I am curious what that Untitled Pixar Animation is! No word on Disneytoons film which was previously announced for April 12, 2019. I still think it is going to be an Elena of Avalor movie because she is so popular but it could also be Star Wars. Who knows? I am also surprised they announced this now and not at D23/Star Wars Celebration. It seems a little random but whatever. I agree about the Wreck it Ralph title – yuck! It sounds like the title for a fan fiction writer by an amateur 😁. Gigantic sounds really fun and I’ve never heard of “Wrinkle in time and Magic Camp”, didn’t even know a Disney movie with that title is coming out 😁. Kinda excited for Lion King remake and really hope it matches or somehow goes better then the Jungle Book visuals because they blew me away!! Frozen 2 … YEAH and NAH! I LOVE the frozen soundtrack. I know some people call it overrated but I still love it – hoping for songs that reach the bar they set. Yeah, this was shocking news that I too wasn’t expecting to see until the D23, at least! Gigantic is the biggest bummer as that what probably the one I was most looking forward to! I’m glad they finally moved that mystery film to next year, lol, although it’s still a mystery! I liked Indy 5 being released in 2019 as it was on my bday, but now it’s The Lion King which I deff won’t be seeing in theaters, bday or no bday. Yeah, Indy will be quite old then; hopefully they film it soon! Frozen 2 I’m not saying that it’s a movie we absolutely needed, but hopefully it’s good. Everything else is pretty much the same. So there’s a lotta live-action Disney (non-Marvel) in 2018: Mulan, Magic Camp, Wrinkle in Time, Mary Poppins Returns, and now the mystery film! Dumbo is confirmed for next year? That’s probably gonna be the mystery film then. And in 2019, there are 5 “live-action” Disney films. One is The Lion King and the other 4 are untitled, as of now. 3 of them are Fairy Tale ones, so I’m guessing Cruella, Aladdin, and….Tinker Bell, maybe? Or Little Mermaid? I could be wrong but that’s what I thought I heard. That live action Winnie the Pooh has a director so maybe it? But they haven’t even announced a cast for that or anything yet. Really? Who did they announce as part of the cast for the Winnie the Pooh movie? Oh ok yeah I can see Dumbo being finished first before WTP.